When Peace Child started to be used in hundreds of schools across North America, it became fashionable to say: “Peace Child is not so much a play as a process…” True – up to a point. In introducing this section, it’s important to stress that what must emerge at the end of the process is a performance – a performance with integrity and quality as a piece of theatre, not just as an educational exercise. It is my conviction that a proper execution of “the process” enhances the performance – makes for more compelling acting from the children, more emotive and accurate singing, more passionate and coherent delivery of the message because it is a message that the children have, for the most­ part, written themselves. If the performance shows signs of falling apart or needing that dreaded tag-line “Workshop Performance” – please, I beg you as an artist! – DUMP THE PROCESS – and get on with doing a good play! Do it immediately before you see another group. Compare notes with the Choreographer and Music Director. Split the names into two lists: those for the Core Cast and those for the Chorus. Those who want to be in it but who have no ability to move or sing, and are uncomfortable in improvisation should be offered backstage roles. General Points: If you are doing a community performance, it is good to do auditions in different sectors of the community. For example, for a production in Seattle, the artistic staff auditioned in several parts of the city to draw in children from the various ethnic groups. Be sure to advertise your auditions widely!! Your success in getting people to auditions is an indicator of your ability to get people to buy tickets to the show! The Read-through: Even if you are going to spend some months doing classroom study of the Lesson Plans, it is good to begin the formal process of preparation with a “Core Cast” read­ through of the script. The Chorus, sadly, cannot be a part of this: it’d be just too many They should be rehearsed separately and their movements rehearsed into the play in the final week. Get everyone into a circle and start reading from Page One – reading all stage directions, everything! Everyone should read something, including the music director, the choreographer, the stage manager. Make everyone feel involved in the words on the page. Even you. Where are we?” The first thing you must decide is where your Peace Child is set. Which occasion are you using to launch the process by which peace and happiness comes to our world? Obviously, we hope you will use the Hague Appeal for Peace, or the Millennium Young People’s Congress, but it could be anywhere – anything: a United Games week-end; an international youth event in your home town – or something very small like the arrival of an international visitor at your school – or a birthday party at which an old friend turns up with their family. Think about it, be creative! Every other decision you make about your production will flow from this first decision. After you have got some suggestions, slide down through the scenes and see which ideas fit best – and how much will need to be changed. Discuss the ideas with the cast and see if there is a consensus. If not, take a vote: the idea with the most votes wins. Note: I have recently been told of two productions where the producer preferred to leave the “place” indeterminate, hinting at several events around the world. This is clearly another solution. The best way for a community cast to do this, especially if you are pressed for time, is to split the cast into small groups of 5 or 6, and taking a lesson each (include stage managers, choreographers, dancers – everyone!). Each group should read the background material, discuss the discussion points, do the improvisations and present their findings to the whole cast. Each group should include an improvisation in their presentation along with detailed suggestions on how to adjust the script. improvisations. Take copious notes and write up on large sheets of paper lines or ideas for scenes or characters or songs that people seem to like. Give the notes to the writer and let him/her fashion it into a First Draft script. The frenzy of activity and improvisation doing the lesson plans should allow you to get to know your cast well. Many parts will have cast them-selves. Names must now be ascribed to the others so that, in the First Draft Script, Child 1 will have become “Malcolm” – Kid 5 will be “Natalie” etc. The Presidents, commanders, parents etc. are character parts: the kids should invent outra­ geous names for them. But for themselves – for the core group of children that spread out across the world and end up at the United Nations, let them carry their own names. Let them be Peace Children. Once you have completed the improvisations, drafted a script, named the characters and written the Drop-in Sections, you should print out a “Line Text” in as few pages as possible and make photocopies for the entire cast. Now all is prepared for REHEARSALS TO BEGIN!! REHEARSAL HINTS: In the normal business of rehearsal – doing the blocking, setting the songs, – I find that kids learn their parts in a second. If they don’t there is something wrong with the lines and they need to be changed. A good way to do this is to “Take the dog for a walk” through the script. You know the way a dog on a lead scampers from one side of a path to another, exploring different smells. In a similar fashion, should allow your actors to wander down the wood­land path of your script, straying wildly from the text, exploring side-paths, jumping in ponds, relaxing in clearings. See what new ideas emerge. If you like them, splice them into the script. If a funny line isn’t being funny, find a bit of business that makes it funny – a silly hat, a prop, an extravagant gesture. If the line still doesn’t get a laugh, change it or cut it. A Peace Child show with flat jokes is deadly. Work the transitions. Make sure every child knows where they are coming from, where they have to get to, how they are leaving. Especially the Core Cast. Do double-speed run-throughs to make sure that the kids know the text – very well! We never use a Prompter in Peace Child. If a kid dries, the others must feel confident about filling in with improvisations until the scene gets back on the rails of the agreed script. It’s the best safety net. The Dancers, the Chorus and the Singing Soloists should rehearse separately, in different rooms. So will the Core Cast principles. This is good. Don’t present the scenes or numbers to the full rehearsal until you are happy with them. Then impress everyone with the QUALITY of each component. New Characters: Take the “Child 1, Child 2” characters and, as well as giving them a name, give them a characteristic: maybe one is a joker; another is the star of the swim-team or an ace chess player – one might always wear green or has a mother who likes hanging out at shopping malls. Develop new characters in new scenes. New Scenes: As you explore the lesson plans, ideas will come flooding from the kids; the script will quickly become constricting. Cut whole scenes: make space for new ones, new sub-plots – new jokes! New Songs: Nobody knows if they can write a song until they’ve done it. If they can write a lyric, they can write a rap; if they can write a rap, the next step is to write music. Work closely with the Music Director to help kids complete and perform new songs. Also, look through the Music Score – you will find new songs that are not woven into this script which you can use. Two of these, Say you love this world and Myechta, were both written by cast members, Ella Vituk and Colleen Barry. “We want this world to survive” was written by 18-year old Pavel Sydor from Poland for whom English was his 3rd language. New Story- New Play: New scenes, new songs, new characters will start to send tremors down the length of the play. New story ideas are bound to emerge. Pursue them: Peace Child gives you the freedom to explore major world events as they hap pen. As I write this, NATO is bombing Serbia and the war shows every sign of spreading into Montenegro and the rest of the Balkans: if I was doing a Peace Child show at this moment, I would feel compelled to include a discussion of this latest madness. I urge you to be as daring as you can possibly be in your departure from this basic script. If you are doing all the above, you can say you are doing a Peace Child. If you are doing only one or two of the above, you are probably doing your own play and you should consider calling your performance something else. .These budgets are based on the actual costs of three, very different productions. Sales of Merchandise – T-shirts, programmes, mugs, etc. Without a well-thought out sales operation, this does not often make much money. It requires up-front expenditure to purchase stock, and can leave you with a lot unsold. Tread carefully. 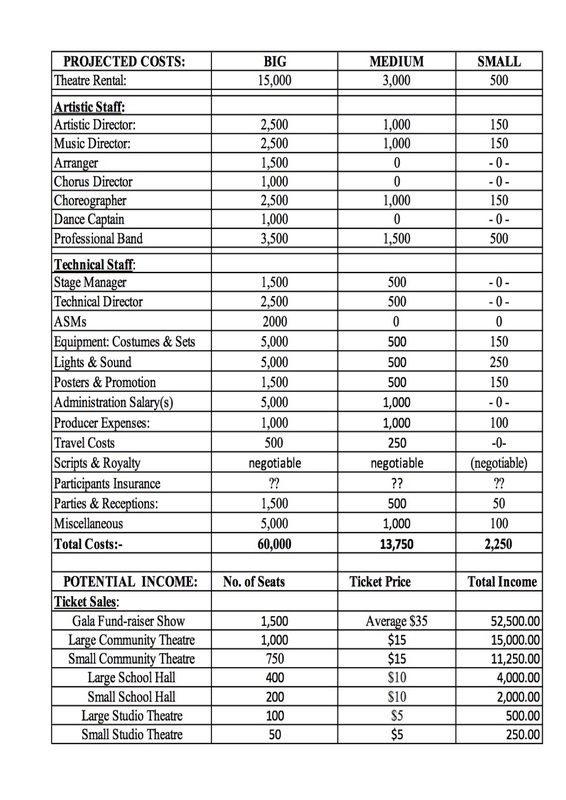 GALA: All productions should aim to have a “Gala” Opening performance, or last show to which local officials and dignitaries may be invited; not only will this raise money to help cover the · budget, it will also ensure that the children is message reaches the ears of those in a position to act upon it. International Productions: These are the best kind of Peace Child shows – but they are expensive as you have to find homestays for the International kids, and you have to work, eith. er through Peace Child International Headquarters or another agency, to get kids to come from overseas. Any child coming from a developing country or a war zone will normally require their ticket to be paid. However, the determined producer can make this all happen – Steve Elliott and the Monkton Heathfield Community School raised thousands of pounds to bring kids from many places to a magnificent production that ran in a local theatre and London’s West End in the presence of royalty! NOTE: ALL PRODUCTIONS ARE DESIGNED TO RAISE FUNDS FOR ON-GOING WORK!